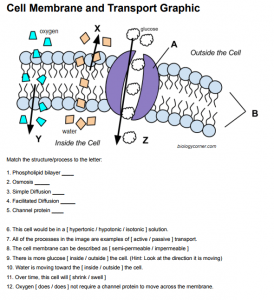 This reinforcement worksheet displays a graphic of the cell membrane showing the phospholipid bilayer and embedded proteins. Students identify structures within the bilayer and use reasoning to determine how molecules are moving across the membrane in response to a hypertonic solution. Worksheet was designed for freshman level biology classes who are studying osmosis and diffusion. Students should be able to recognize that water is leaving the cell because it is placed in a hypertonic solution. Glucose is shown moving into the cell through a protein channel, a process known as facilitated diffusion. Oxygen and water move across the phospholipid bilayer from areas of high concentration to areas of low concentration. Nice worksheet, but wouldn’t it be more accurate if water was moving through aquaporins (or water channels) instead of just through the phospholipid bilayer. I was just thinking about modifying the graphic to include those!